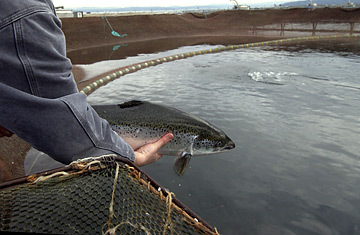 A man holds a farmed salmon. In her book Diet for a Small Planet, Frances Moore Lappe argued more than 35 years ago that grain-fed cattle were essentially "reverse protein factories" because they required many more pounds of plant protein to produce a pound of flesh. Now there's a similar dynamic in the global fish farming, or aquaculture, industry  especially as it strains to satisfy consumers' voracious appetite for top-of-the-food chain, carnivorous fish, such as salmon, tuna and shrimp. Close to 40% of the seafood we eat nowadays comes from aquaculture; the $78 billion industry has grown 9% a year since 1975, making it the fastest-growing food group, and global demand has doubled since that time. Here's the catch: It takes a lot of input, in the form of other, lesser fish  also known as "reduction" or "trash" fish  to produce the kind of fish we prefer to eat directly. To create 1 kg (2.2 lbs.) of high-protein fishmeal, which is fed to farmed fish (along with fish oil, which also comes from other fish), it takes 4.5 kg (10 lbs.) of smaller pelagic, or open-ocean, fish. "Aquaculture's current heavy reliance on wild fish for feed carries substantial ecological risks," says Roz Naylor, a leading scholar on the subject at Stanford University's Center for Environmental Science and Policy. Unless the industry finds alternatives to using pelagic fish to sustain fish farms, says Naylor, the aquaculture industry could end up depleting an essential food source for many other species in the marine food chain. Industry and publicly funded research have significantly mitigated this inefficiency and reduced the percentage of fish and oil content in aqua-feed, replacing it with vegetable proteins and oils. "I would say cost, the sustainability of resources  pelagic fisheries  and human health concerns have been driving researchers to find replacements for fishmeal and fish oil  and we are doing this to the greatest extent possible," says Dr. David Higgs, a fish nutritionist for the Canadian government who works closely with British Columbia's $450 million salmon industry. (Reducing the fish content in feed also reduces the accumulation of PCBs in farmed fish, though Higgs insists that PCB levels in fish from British Columbia are some 50 to 70 times below FDA standards.) But such improvements have been offset by the industry's explosive growth. In the salmon industry, the largest aquaculture sector, the amount of wild fish required to produce one unit of salmon was reduced 25% between 1997 and 2001, but total industry production grew by 60% during the same time. "The problem is we've gone straight to the top. We are essentially, as some argue, farming tigers when we raise tuna or striped bass or cod," says Brian Halweil, a senior researcher with WorldWatch, a Washington-based environmental NGO. By contrast, the fish species at the core of the millennia-long tradition of fish-farming in Asia and parts of Africa  catfish, carp and milkfish  actually require less fish input than is ultimately harvested, because they are herbivorous or omnivorous. In Asia, the idea of feeding several times more fishmeal to get one pound back would seem sheer folly. "Ultimately that is really where the solution is  to cut back on these carnivorous species and turn our attention to these plant-eating ones," says U. Rashid Sumaila, a bioeconomist at the University of British Columbia (UBC). "Whether we are willing to do that is another thing, but that's the fundamental solution." Environmentalists and industry dispute whether current wild-fish harvesting is done at sustainable levels, but there's no dispute that it's a finite resource  and demand keeps growing. A staggering 37% of all global seafood is now ground into feed, up from 7.7% in 1948, according to recent research from the UBC Fisheries Centre. One third of that feed goes to China, where 70% of the world's fish farming takes place; China now devotes nearly 1 million hectares (close to 4,000 sq. mi.) of land to shrimp farms. And about 45% of the global production of fishmeal and fish oil goes to the world's livestock industry, mostly pigs and poultry, up from 10% in 1988. If current trends continue, demand for fish oil will outstrip supply within a decade and the same could happen for fishmeal by 2050, says Stanford's Naylor. Already, the global supply of fishmeal has dropped from 7.7 million metric tons to 5.8 million metric tons between 1994 and 2005, according to the International Fishmeal and Fish Oil Organization. There are other collateral problems created by industrial scale aquaculture: the destruction of coastal habitats through waste disposal, the introduction of diseases and the possible escape of exotic species that can threaten indigenous breeds. Halweil says we need to farm fish in ways that more closely "mimic the oceans," combining multiple, complementary species, including "cleaner fish" to control sea lice, for instance, as some farms already do in Norway. The meaning of sustainability, however, is a moveable metric, shaped, at least in the U.S., largely by restaurants where 70% of seafood consumption occurs. "As chefs, we need to celebrate diversity in the oceans so that we are not relying too heavily on any one species," avows Peter Hoffman, executive chef at Manhattan's Savoy restaurant and board member of the Chefs Collaborative, which is committed to sustainability. The challenge is partly creative: making tilapia, for instance, taste as delectable as seared ahi. Meanwhile, WWF, formerly known as the World Wildlife Fund, has been working with producers, buyers and various NGOs since 2004 to craft voluntary industry standards aimed at minimizing or eliminating environmental damage. "This is a major priority for us," says Jose Villalon, who heads WWF's recently expanded aquaculture team. Standards will yield certifications of sustainability for a range of popular seafoods; the first, covering tilapia, is expected by the end of the year. Were people simply to eat more fish that live lower down in the food chain, it would mean significant ecological pluses with no real diminution in human health benefits. That calculus may already be helping to recharge the allure of the modest shellfish, including the oyster, which is the target of reseeding campaigns from Long Island Sound to Puget Sound, where it has been most successful. Not only are oysters, along with other mollusks, good for you  oysters are freakishly high in zinc  they feed themselves. And by being able to thrive even in slightly polluted water, they provide an invaluable ecological service; a single adult oyster can filter 50 gal. (189 liters) of water a day. When Jamestown's founder John Smith first sailed into the pristine Chesapeake Bay 400 years ago, he had to navigate around oyster reefs 20 ft. high and miles long, which were effectively filtering the entire estuary  the country's largest  every few days, according to Rowan Jacobsen, author of the recent book A Geography of Oysters: The Connoisseur's Guide to Oyster Eating in North America. "If we can get oysters [back] to historic levels they can make a huge difference," he says, but his dream of a return to oyster's golden age  in the late 19th century when 100 million lbs. (more than 45,000 metric tons) of oysters were harvested from the Chesapeake every year, versus today's 250,000 lbs. (113 metric ton) haul  is a long ways off.